Why not leave bustling Barcelona for a day outdoors? Barcelona is a short way away from the summits of the Catalan Pyrenees where we can enjoy amazing walking in the Pyrenees – trekking routes in mountain scenery, in valleys with forests and springs. This is a thoroughly satisfying excursion, and can be tailored to suit the ability of the participants. 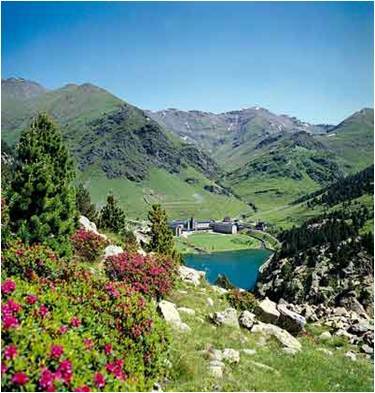 We will go to the Nuria valley – a beautiful valley situated among the high peaks of the Pyrenees, with a lovely lake in the center. The only way into this valley is by a special funicular (the rack railway) which climbs 1000 meters along 12 Km. The route and the valley itself offer magnificent sceneries of the mountain range, the streams and brooks. The Temple of the Virgin of Nuria, the Patron Saint of shepherds and a very important sanctuary, is in the upper part of the mountain. We will walk back from this valley along marked paths to the base village of Queralbs. After walking for three or four hours we will enjoy an outdoor picnic or a meal at a traditional Catalan restaurant. On this day we will also visit the monastery. The medieval Benedictine monastery in Ripoll is one of the most famous of its kind in Cataluña. Originally built in 879, it is the resting place of the remains of many counts, bishops and monks. It’s most noted for two things: the impressive Romanesque entranceway (or portal) that is one of the finest examples of Romanesque architecture in Europe and the fact that Guifré el Pelós (Wilfred the Hairy) is buried here. Walking in the Pyrenees can free your spirit and this specific day is just marvelous! It is suitable to all ages, tailored to the ability of the participant.